In 1969, psychedelic, funky, conscious material was where Motown was at. The Temptations led the way, followed by Marvin Gaye and Stevie Wonder. Even Diana Ross & The Supremes had put out the controversial "Love Child" single. Here, another of Motown's most competent, and comparatively underrated at the time, vocalists did the same, produced by the master of that genre, Norman Whitfield. This is Gladys Knight & The Pips' heaviest, funkiest, most "aware" album. It kicks off with their powerful, funky take on The Temptations' "Cloud Nine". "Runnin' Out" is a big, thumping bassy number, while Gladys's vocal on "Didn't You Know (You'd Have To Cry Sometime)" is positively Aretha Franklin-esque. This is just a monster of a soul song, just perfect. 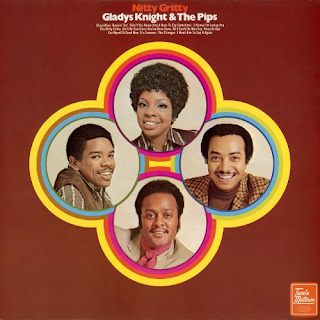 Their version of The Temptations' "I Know I'm Losing You" has the most pulsating, powerful backing (great stereo sound, by the way) and, again, Gladys' vocal is peerless. Any of these tracks that have been covered by her, you have to say that she does them superbly. Just listen to her voice (and those horns) on the impossibly funky, cookin' "Nitty Gritty". Many people know Gladys for her seventies work on the Buddha label ("Midnight Train To Georgia', "The Way We Were" etc), but this is where Gladys really cut her teeth. Some of the stuff she did for Motown was superb, and it never really got the credit it deserved. "Ain't No Sun Since You've Been Gone" is another slice of pure funk. This is, in my opinion, up there with Aretha Franklin's "I Never Loved A Man The Way I Love You" as one of the great sixties female soul albums. "All I Could Do Was Cry" is not quite as good as the others, but it is certainly more than acceptable. "Keep A Eye" is a soaring, upbeat punchy, pugnacious number as, too, is "Got Myself A Good Man", with Gladys in Aretha mode once more. The Temptations' "It's Summer" is covered soulfully. "The Stranger" has a real Northern Soul feeling about it, with a pounding beat and killer saxophone in the middle. "I Want Him To Say It Again" is jam-packed with funky organ breaks and piledriving bass and drums. This really is a vibrant, energetic album, dripping with Motown pumping down'n'dirty funk. "Billy, Come On Back As Quick As You Can" is a bit of a "Cloud Nine" re-write, but it is still hot, and the social consciousness of "Friendship Train", with its searing guitar intro is both rousing and uplifting. "This train stands for justice..." Gladys hollers - her voice on this is great, she is in total command. Singers like this had such a gift. She was definitely up there with the very best and should duly be acknowledged as such.